How much time required in Nutrite FUE Transplantation process? 7 to 8 hours are required in the process of Nutrite FUE transplantation or it can distributed over 2 sittings. What is the cost of the Nutrite FUE surgery? 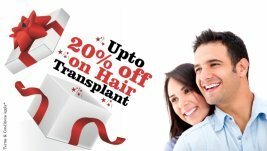 The cost of Nutrite FUE hair transplant is totally depending upon the complexity of the hair restoration. Its cost differs from the patient to patient. In this treatment cost are based upon the graft. Is this process is painful? No, this process is not at all painful as at the time of surgery local anesthesia is given to the patient and patient can watch TV, listen music nd can talk to doctor while the surgery is going on. Is the Scars are visible? No, the scars will not be visible after the surgery as the hair follicles are extracted individually from the donor region. Is there any kind of side effects of this process? Swelling, Itching and Discomfort can be feel by the patient but this all effects are temporary it can be recovered within few days.